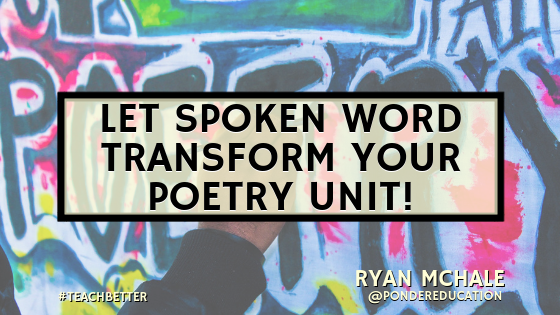 Let Spoken Word Transform Your Poetry Unit! Don’t Fear the Poetry Unit. I don’t know about you, but the loudest collective groan to ricochet off the four walls of my classroom occurs the moment I announce the start of our poetry unit. Without fail, students go into panic mode. They offer to do double the homework for a month if we could just read another novel. I guess I can’t blame them. After all, I’m pretty sure I was terrified of poetry in the 8th grade. As I grew older, however, I realized that poetry isn’t just a “necessary evil,” arbitrarily embedded in our curriculum. Quite the opposite. It must be taught because it’s literature at its finest. Today, I adore poetry. How can one not love visualizing the exquisite pictures that are so vividly painted in our minds by the meticulously chosen words that flow so effortlessly throughout a poem? I guess it’s easy for me to say. But try telling that to a group of 14 year olds! It never ends well. At least at the start of the unit. You see, I realized that as wonderful as classic poetry may be, many 21st century students fail to make real-life connections with the works of Shakespeare, Whitman, and Thoreau. And in this day in age, making connections while reading is imperative for the vast majority of kids whose minds tend to roam quicker than ever. Knowing that I still had to ensure my students understood basic concepts such as figurative language, tone, mood, rhyme scheme, etc., I set out to completely transform my poetry unit. I decided to take a big risk. I removed many of the classics and replaced them with contemporary, spoken word pieces. Ultimately, it was one of the best decisions I’ve made regarding my curriculum. With today’s students desiring to make a real connection to lesson material, spoken word poems are ideal additions to poetry units. If you were to ask students to identify the characteristics of poems they’d most likely enjoy, spoken word poetry would find all the pertinent boxes checked. Spoken word poems often tend to be dramatic (√), discuss issues today’s teenager can relate to (√), and full of pure, unadulterated passion (√). In 1984, American poet, Marc Smith created the first known poetry slams in which poets were pitted against one another in front of a live audience. These performances were judged by both the content of their piece as well as their on-stage performance (tone, gestures, etc.). Spoken word later gain popularity in the early 2000s when Russell Simmons began airing Def Poetry Jam on HBO. Today, spoken word poetry continues to grow at a rapid pace. Earlier this year, Rudy Francisco performed a spoken word piece on The Tonight Show with Jimmy Fallon. A poetry performance on late-night TV! There’s something you don’t see every day! Over the last two years, I’ve found that my 8th grade students become so engaged in any lesson dealing with spoken word poetry. Even my most reluctant writers have found their voice during the unit. It’s an unbelievable outlet for these kids who, at their age, are frequently having to deal with a whirlwind of uncontrollable emotions. Last year, I had so many students fall in love with the art of spoken word that I started my school’s very first Spoken Word Poetry Club. I can’t tell you how rewarding it was to see these amazing students taking creative risks in hopes of improving their craft through the cathartic process of poetry writing. Where to Start with Spoken Word Poetry? There’s so much spoken word poetry out there these days. Understandably, it can be overwhelming at first. I would most certainly recommend visiting Button Poetry, a site dedicated to the promotion of spoken word poets from all over the world. Their YouTube page has an extensive list of performances to show your students. For the most part, many of the poems are safe for school. However, there are plenty of pieces that contain adult language, sexual references, and more. Just be sure you’re previewing any video prior to showing in class! That’s it for me, friends! Thanks for reading! Stay tuned for two new episodes of our podcast, Pondering Education next week! CLICK HERE TO CATCH UP WITH LAST WEEK’S EPISODES! Ryan McHale has just started his 9th year as an English Language Arts teacher in Milford, Massachusetts. He’s presently working with 8th graders in hopes of getting them academically and socially prepared for the challenges that await them in high school. In addition to fulfilling his role as a classroom teacher, Ryan serves as the Curriculum Coordinator of his building (Grades 6-8), serves as the advisor to the school’s Gay-Straight Alliance, and is currently working to earn his Doctoral Degree in Educational Leadership from the University of New England.